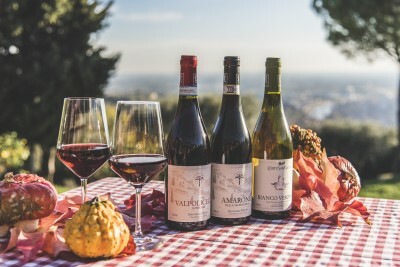 Enjoy the combination of natural and artistic wonders of the area of Verona (Italy), with the visit of accurately selected wineries and the tasting of Valpolicella, the Veronese King of wines, Bardolino, the ruby red wine of Garda Lake, and Soave, intense and gentle, from a full green valley. Individual arrival in Agriturismo Costa degli Ulivi, located in Fumane (Verona), in the classic Valpolicella area. Welcome drink. Meeting with the local agency and bike delivery. Dinner at Agriturismo Costa degli Ulivi. We leave from Agriturismo Costa degli Ulivi and we ride up along a winding panoramic road that leads us to the ancient village of San Giorgio Ingannapoltron. From the main square, surrounded by beautiful stone houses, we can enjoy one of the best views over Valpolicella and Lake Garda. 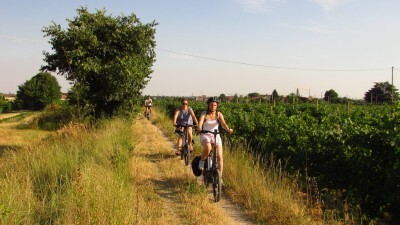 We go down to the flatlands and we cycle among terraces, vineyards and Venetian Villas. We taste the Valpolicella wines of Tenuta Salvaterra, while we admire the elegant Villa Giona: wine and art, the perfect marriage! Finally we ride back to the Agriturismo enjoying a great view over the mountains of Verona. Dinner at Restaurant (van transfer RT). 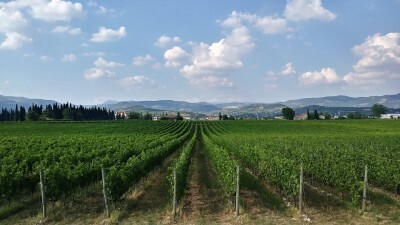 We approach to the Lake Garda area with a short transfer by van and then we start cycling on small hills covered by vineyards and olive trees. The road slightly goes up and down, from the highest points we can enjoy great views over the big Lake Garda, sorrounded by hills and high mountains. 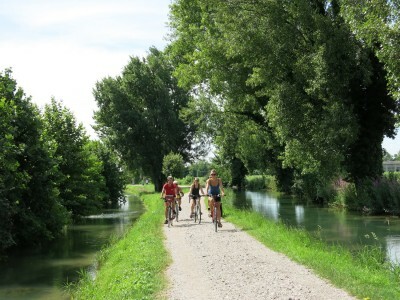 We cycle on country roads flanked by elegant cypresses until the medieval village of Garda. We follow the bike paths that coasts the shores of the lake and we reach the lively village of Bardolino. After a few chilometers we reach Casetto Winery, where we taste the Bardolino wines enjoying a great view over the lake and Mount Baldo. We go back where we started biking, following inland roads surrounded by vineyards and tranquillity. With a short van transfer we’ll be back to Agriturismo Costa degli Ulivi. Dinner at Agriturismo Costa degli Ulivi. With a transfer by van, we reach the area of production of the Soave wines, then we cycle on small country roads surrounded by vineyards. On our route we find a few climbs that allow us to enjoy the panorama over the green fields covered by vines. We reach the village of Illasi and its two elegant Venetian Villas overlooked by a medieval castle, then we ride up a small hill following a panoramic road. 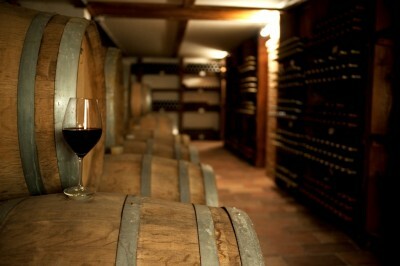 On the way down we stop in Cantina Tenuta Coffele, where we taste the Soave wines. In the last kilometers we visit the medieval village of Soave, surrounded by majestic walls and overlooked by a great castle: the perfect ending of this tour! The van waits for us and takes us back to Agriturismo Costa degli Ulivi. Dinner at Restaurant (van transfer RT). DAY 5 –Departure: after breakfast, individual departure from Agriturismo Costa degli Ulivi. On request, it’s possible to extend the stay with an extra overnight in Verona city centre. Min 6 Max 14 with 1 tour guide. Our tour leaders speak English and Italian. German, French, Spanish speaking tour guides are available upon request.